The Ada class corvette F-511 TCG Heybeliada is continuing her trip across the North African Countries. After Alexandria Egypt, she has visited Tripoli Libya. 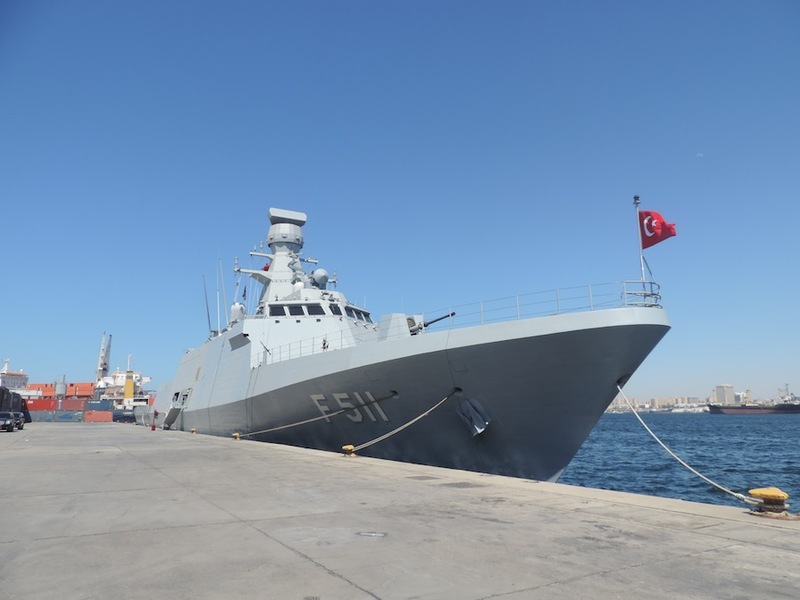 The first Turkish navy ship to enter Libyan waters since 1911, when the Ottomans lost what became Libya to the Italians, docked yesterday in Tripoli harbour. The frigate, TCG Heybeliada, arrived yesterday morning on a visit designed to promote Turkish-Libyan naval ties, including support for the Libyan navy. The visit also celebrates the 500th anniversary of the world map drawn in 1513 by Ottoman admiral and cartographer Piri Reis and is part of North Africa tour to mark it. As well as Tripoli, the frigate is visiting ports in Egypt, Tunisia, Morocco and Algeria. It arrived from Alexandria. At a press conference on board yesterday, attended by members of the Libyan navy, Turkish navy officers spoke both of the relations between the two countries and the need for naval cooperation between all Mediterranean countries, particularly in the field of military training. In Libya’s case, this was anticipated to include support from the Turkish navy in the rebuilding of the Libyan navy and training for Libyan naval cadets. It is also expected to include the construction of vessels as well as the provision of expertise and technical support, as well as an exchange of visits and consultations between officials of the two countries’ navies. The vessel’s commander said during the press conference that what is now Libya and Turkey had enjoyed good relations for 500 years. Asked if the Turkish naval skill support had been offered to Libya, a Libyan navy officer said that a number of friendly countries has agreed to provide help and support. The above report of the Libyan Herald ignores the fact that a number of Turkish warships docked in Libyan ports during the civil war in this country that ended the Qaddafi regime, but this is not my point. The Moroccan port of Casablanca was the next stop for TCG Heybeliada after Tripoli. Casablanca, June 25, 2013 (MAP) – The military ship TCG Heybeliada, Commander of the Turkish Naval Forces, visited Tuesday at Casablanca port for two days before heading to Spain before returning to Istanbul, its home port after 35 days journey. This building, modern multi-role, was built entirely by the Turkish shipbuilding industry Milgem kind. It is 99.5 meters long, 2,400 tons and gauge uses two MTU diesel and turbine LM-2500 gas engines, said at a press briefing Captain Yachar Chamour. This corvette, the first building of this class (Milgem) 85 sailors onboard account between officers and crew. It was launched in September 2008 and had made his first trip two years later in November 2010, he said, adding that the second ship will be operational in September. It is equipped with electronic systems including weapon launchers cruise missiles and Harpoon anti-ship, anti-aircraft missiles RAM, the 76 mm gun and MK46 torpedo, explained the captain. The Milgem class has a radius of 5,000 km, a top speed of 30 knots, can stay 45 days at sea and has a platform to accommodate a helicopter. This visit to the port of Casablanca offers the opportunity to promote dialogue and cooperation and contribute to the development of military relations between the two countries, he said. The Algerian capital, Algeria is the next scheduled port of call for TCG Heybeliada. She is planned to arrive there tomorrow and will remain till Tuesday. This is the first cruise of TCG Heybeliada for such a long duration. It will bring valuable lessons about operating this class, as a single unit for extended periods away from the organic support of Turkish Navy. This tour is a very good way of increasing the soft power of Turkey in the region by using a Turkish designed and built warship. It is a text book example of power projection by naval forces in peace time operations. I am sure that this voyage is also a part of the efforts to market the Ada class corvettes to foreign navies. Thank you for sharing these links with me.